← Has the chrysalis stage begun? In early May, I gave a presentation to the Financial Planning Association, which I titled, Financial Planning in the Emerging Butterfly Economy. The slide show was posted here shortly thereafter. Now, thanks to Bill Jackson, we have that presentation in movie form, complete with my slides and narrative. You will find both of these listed in the sidebar to the right under, My Audio-visual presentations You can also view the movie by going directly to the Slide Show Album on my Vimeo site, http://vimeo.com/album/1660843. You should also be aware that the United States has for the first time in its history, lost its triple-A debt rating. Standard & Poor’s announced on Friday that “it lowered its long-term sovereign credit rating on the United States of America to ‘AA+’ from ‘AAA’. Standard & Poor’s also said that the outlook on the long-term rating is negative,” which suggests that further downgrades are likely. You can read the entire S&P statement here. The recent budget cuts agreed upon by Congress are a mere drop in the deficit “bucket.” As I said many years ago, so long as the debt-money system based upon compounding interest prevails, the federal government budget cannot be balanced. As we have seen very clearly in the recent bailouts by government of banks and financial institutions, government is the borrower of last resort. 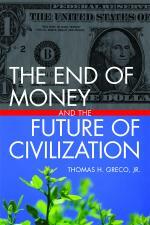 If government does not play that role, the entire global financial system collapses, as it almost did in 2008.-t.h.g. This entry was posted in Global Economy, My activities, The Debt Imperative. Bookmark the permalink.